The author examined the significance of production design in film. This paper reviewed scholarly articles on the evolution of production design and applied her findings to analysis of Baz Luhrmann’s 2013 rendition of The Great Gatsby. This study revealed that accurate and creative production design is essential to success in film. Analysis of The Great Gatsby showed that production design reflected an Art Deco style, the period of 1920s, and the representation of characters in the film. Without the intricate and well-planned production design, the themes of the F. Scott Fitzgerald’s novel would not have resonated with the film’s audience. This paper shows how production design effectively transported the audience to a different time period. Going to the movies is an activity all Americans love. Whether it is for the story, characters, atmosphere or the simple joy of spending time with friends and family, cinema is an essential part of our culture. A large attraction to cinema is its ability to transport an audience to an entirely new world. If the story is fictional or based on a real event, movies can take the viewer to any location, time period, or economic status that they’ve never experienced before. Production design is the secret behind the magic. Because of production design, movies have overcome the constraints of time and wealth. Only few people experienced the sinking of the Titanic or what it was like when Abraham Lincoln finally passed the Thirteenth Amendment. Outstanding production design allows viewers to feel like they were undergoing these events. It allows an audience to relive history. In Production Design and the History of Film, C.S. Tashiro explains, “Film design works from the difference between the physical world as it exists and the requirements of a particular narrative” (Tashiro, 2004, p. xvi). The powerful mixture between history and cinema offers the ultimate experience. Production design, of a period film in particular, creates an intriguing world and enhances the story through style, exemplification of a time period, and representation of character. Beverly Heisner explains in Hollywood Art: Art Direction in the Days of the Great Studios, “Visual ambiance of the film may enhance its emotional dimensions, nonverbally further the plot, draw character profiles, and in enumerable ways add to the content of the film” (Heisner, 2011, p. 2). The design and intricate details of a film’s set encompasses the story, thickens the plot, and brings the audience back in time. Baz Luhrmann’s 2013 rendition of The Great Gatsby is an excellent example of how production design can make a well-known story and loved characters come to life. As suggested by pertinent literature, production design of a period film should consider style, period, and characters. This paper analyzed the three main elements of production design in The Great Gatsby: the style, time period, and representation of character. Production design began in the 1920s and 30s, when filmmakers started to realize the role movies had on social values and ideals of American culture. Emphasis on production design began as a marketing technique during the Great Depression to promote a better life during a difficult time. It quickly became obvious that set design had the power to “mitigate the social and economic crisis of the Depression by exploiting the standards and mores of the burgeoning consumer culture” (Esperdy, 2007, p. 198). Movie sets had the ability to set trends, arbitrate public taste, shape public opinion, and inspire millions of Americans. Elaborate production designs could take a film’s audience out of hard times, and into a world of wealth, elegance, and even a completely different era. As explained by Maggie Valentine in Escape by Design, “In the movies, actors— guided by a director, aided by a set designer, and enhanced by a costume designer—interpret a script developed by a screen writer. Everything is fictional, manipulated, changeable” (Lamster, 2000, p. 158). The intricate manipulation of these worlds, through production design, can inspire and influence audiences. At the start of production design, real architects were called to design and create the sets. Not only did filmmakers receive beautiful results, but architects were additionally able to reach audiences up to 80 million people. The American Institute of Architects said, “The buildings they depict are not permanent to be sure, but they reach many more people with their message than do many permanent buildings” (Esperdy, 2007, p. 198). In the 1920s, publications such as American Architect, The Architectural Record, and Pencil Points claimed motion pictures were the ideal field. In his book Architecture for the Screen: A Critical Study of Set Design in Hollywood’s Golden Age, Juan Antionio Ramirez writes, “One might say that film has welcomed without reserve the so-called ‘Renaissance Architect’ [i.e. an architect skilled in many areas]” (Ramirez, 2004, p. 14). Production design was described as an unparalleled opportunity because of the ability for creative exploration. While this creative freedom was liberating, it also came with a lot of pressure. Production designers and art departments, even today, have to coordinate with screenwriters, costume designers, cinematographers, directors, and studios to meet the demands of a particular look. Much of the difficulty and pressure production designers experience results from the fact that they must be able to design anything from anywhere at anytime. Production design is a form of architecture where full environments are created. Everything from living spaces, to facades, and even entire towns are designed and built. Additionally, more people will see these sets than those who would see the actual town or building the set is based on (Heisner, 2011, p. 2). Whether the set was an established look or avant-garde, production designers should be able to represent all periods and all nationalities. The earlier days of production design tried to portray what the audience would see in present day America, especially an wealthy urban America that “depression era movie-goers want to believe existed somewhere” (Esperdy, 2007, p. 201). Production designers were hesitant to try to produce period pieces because they did not have the means to make the films authentic. Early production design focused on duplicating a world that many audiences wished to be a part of. When period pieces became more popular, the measure of success for films relied on the accuracy of the details in the production design and set decoration. Art departments and studios launched research departments to ensure every detail was exact to the time of the film. These research departments consisted of libraries of art, architecture magazines, books, photographs, etc. (Esperdy, 2007, p. 205). The sets and their overall atmosphere were highly expected to be flawless so the “story and character could proceed without fear of tripping over a wayward, incorrect detail” (Tashiro, 2004, p. 40). Historically accurate production design did not only affect the film’s viewers, but also the success and validity of the actors. Production designer of The Great Gatsby, Catherine Martin, says, “You cannot underestimate the impact that creating an environment has on the cast—to actually sync them into the world” (Neilson, 2013). Production design uses various elements that come together and bring a discrete “string of associations” among the set dressing and decorations (Kenaga, 1999). The actors and the audience equally benefit from accurate and eccentric sets. Suspense of a film arises when the viewer does not know how the filmmakers will interpret a particular event. Historical accuracy mixed with particular exaggerations makes a movie exciting. This creative use of production design can be seen in The Great Gatsby through elements of style, period, and character representation. The following case study attempted to answer research questions based on the style, period, and representation of character in The Great Gatsby. The first question is how the emphasis of style recreates a specific tone or lifestyle. The second question is how production designers can exaggerate and energize history, while keeping their sets historically accurate. The third question asks how production designers can represent character through the production design of main characters’ homes. By researching the process of Catherine Martin, The Great Gatsby production designer, along with the various sets and elements of design throughout the film, these questions were answered. The Great Gatsby is an exquisite example of how production design, specifically Art Deco design, which exemplifies the 1920s, and the representation of character, are essential to making a period film come to life. Production designer, Catherine Martin, successfully created a believable and desirable world that respectfully depicts a cherished American novel. Catherine Martin’s emphasis on Art Deco style in The Great Gatsby is critical to the movies success. The focus on this design style is essential to creating a luxurious world in the 1920s. Not only is the style important for making the film believable, but in the past “Art Deco sets were immediately associated with the carefree existence of ‘the wild young people of this generation’” (Esperdy, 2007, p. 208). This carefree attitude and atmosphere is certainly fitting for The Great Gatsby. 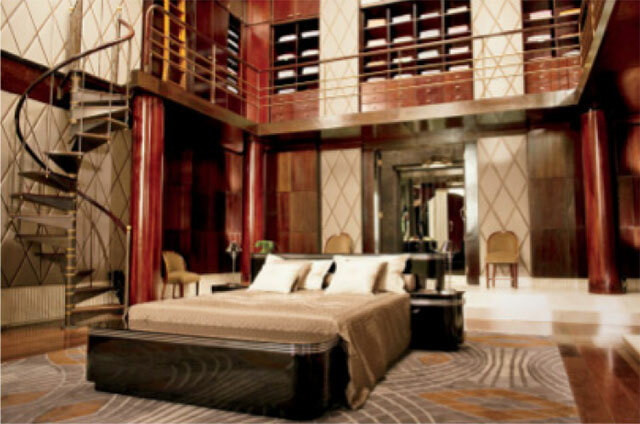 The main character Jay Gatsby’s master bedroom is incredibly modern in the latest Art Deco glamour. Martin says, “One of the people we thought that Gatsby would have known about is a French designer named Émile-Jacques Ruhlmann, so we based the bedroom on a number of Ruhlmann Art Deco inspirations” (Goldfarb, 2013). Ruhlmann was the perfect inspiration considering he was the pioneer of Art Deco in France and felt strongly about designing for the wealthy. Ruhlmann said, “Only the very rich can pay for what is new and they alone can make it fashionable. Fashions don’t start among the common people. Along with satisfying a desire for change, fashion’s real purpose is to display wealth” (Emile, 2007). It is clear Gatsby would have felt similarly and would have wanted to have the latest designs. Art Deco style is associated with Machine Age materials and bold geometric shapes. The style has an automotive and industrial feel, and chrome, leather, and high-polished lacquer are typical types of materials used. Geometric forms, including spheres, triangles, zigzags, stylized stars, sunbursts, and chevrons can often be arranged in symmetrical patterns to create the Art Deco look as well (Klingensmith, 2013). Three main elements of Art Deco style—geometric shapes, lavish ornamentation, and industrial aspects—can all be seen in the production design of Gatsby’s two-story master bedroom. First, Gatsby’s bedroom emphasizes geometric shapes, an element of Art Deco style (see Figure 1). The walls are covered in a harlequin pattern of crisscrossed silk and ribbons of wood (Goldfarb, 2013). The repetition of cream silk diamonds crossed with light polished wood encompasses the walls. These shapes successfully match the similar repetition of diamonds and symmetrical images on the carpet under the bed, which Martin designed herself. Additionally, the rectangles of Gatsby’s drawers and shelves on the second level combined with the repetition of square wood panels on the first level, are clearly Art Deco inspired. The symmetry of the room completely pulls the space together and adds to the emphasis on Art Deco style. Lavish ornamentation is another element of Art Deco style seen in Gatsby’s bedroom. The rich hardwood floors along with the mahogany columns and wall panels are examples of this ornamentation. The mirrored wall panels in the bathroom behind the bed represent a major design choice of the Art Deco period as well. The high-polished lacquer bed with chrome detail and rounded edges attribute the style and depict the modern approach Martin wanted. Small elements of the room, including the rounded chairs, velvet upholstery, and shiny cream and gold fabrics on the bed, add to the tone of the space. The last example of Art Deco style in Gatsby’s bedroom is the use of industrial elements. The industrial aspects of the room add sleek and strong features throughout the space. The stainless steel detail on the bed, and the steel lamps on the nightstands can be attributed to the industrial craze of Art Deco style. Similarly, industrial metals are used in the bronze staircase and railings on the second level. By mixing the stainless steel with the bronze metals, Martin was able to achieve an industrial feel. In order to make a period of time come to life in a film, it is absolutely crucial to have flawless set decoration. Without it, filmmakers would not be able to convince their audiences of the story and transport them into another era. Set designers are responsible for “convincing us we are witnessing the past” (Tashiro, 2004, p. 40). A rule of thumb production designers and set decorators must follow is the Law Against Anachronism. This law states that “filmmakers should include no objects that could not have appeared in the time period of the story because they were invented later. Any period will have legacies of the times before it in addition to those specific to itself” (Tashiro, 2004, p. 41). In terms of The Great Gatsby, Catherine Martin explains, “Baz made a rule that we were able to use any influences or references from 1922 through 1929. His rationale was that the book was set in ’22, published in ’25, and foreshadowed the crash of ’29” (Miller, 2013). This range from 1922 to 1929 allowed the art department of the film to get away with more. The challenge of production designers relies in their ability to energize history. This creativity and ability to rejuvenate the past can be done through thoughtful additions of set decoration. Martin is not a stickler for historical accuracy, rather she “mixes modern pieces that reference the past in order to make that past current.” She says, “My aim is to express the true nature of the period through an electric combination of things that have a real point of reference” (Mason, 2013). Martin exemplifies the period of the 20s through set decoration in the party scenes at Gatsby’s mansion. She successfully does this by using set decoration that fit the time period, yet exaggerate the story. Bergfelder, T., Harris, S., & Street, S. (2007). Film architecture and the transitional imagination. Amsterdam, Netherlands: Amsterdam University Press. Esperdy, G. (2007). From instruction to consumption: Architecture and design in Hollywood movies of the 1930s. The Journal of American Culture, 30(3), 198-211. Heisner, B. (2011). Hollywood art: Art direction in the days of the great studio. Jefferson, NC: McFarland Press. Klinggensmith, D. (2013, June 22). Getting Gatsby’s style: “The Great Gatsby” film pays homage to 20’s Art Deco movement. The Chronicle Herald. Lamster, M. (2000). Architecture and film. New York, NY: Princeton Architectural Press. Ramirez, J. (2004). Architecture for the screen: A critical study of set design in Hollywood’s golden age. Jefferson, North Carolina: McFarland Press. Warner Brothers Pictures. 2013. [Gatsby’s home]. Retrieved from http://www.architecturaldigest.com/ad/setdesign/2013/great-gatsby-film-set-design-slideshow_slideshow_item3_4.